The Einstein of this chapter is a little removed from the Einstein of popular imagination. That Einstein is the first of the modern physicists of the 20th century. He is the the genius of 1905 who established the reality of atoms, laid out special relativity and E=mc2, and made the audacious proposal of the light quantum. This same Einstein went on to conceive a theory of gravity unlike anything seen before and to reawaken the science of cosmology. In his later years, a different Einstein emerged. The mainstream of physics followed the course of the quantum theory of the mid 1920's. Einstein recognized that this new quantum theory enjoyed remarkable empirical successes, so that it clearly had something very right. However he did not believe that future fundamental physics should be to build upon it. Rather he thought the way ahead was to develop the geometrical approach of general relativity into an all encompassing "unified field theory" within which the results of the new quantum theory would be derived. 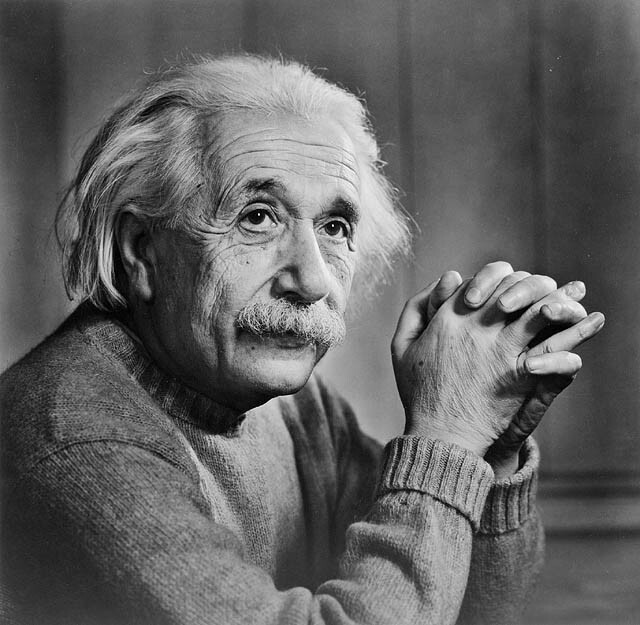 While he had contributed to its development, Einstein became the most prominent critic of the new quantum theory. An example--NOT Einstein's--will make this a little clearer. Consider the air in the room. As far as ordinary measurements are concerned, the air forms a continuous fluid. When sound propagates in air, waves of compression and rarefaction move through the air. We can arrive at a powerful theory of air and sound solely using the representation of air as a continuous fluid that harbors pressure waves. The perfectly regular, nicely rounded pressure waves can be so uniform only because they smooth away all the bumps of the individual atoms. They do however provide a serviceable theory of air and sound waves for many many practical purposes. But they are ultimately an incomplete picture of any particular sound wave. Many different distributions of molecules can be smoothed to give the same wave. So if we are given one wave, we cannot know which particular distribution of air molecules lies behind it. It could be one of very many. Eventually the differences between them will matter. In this example, if we use only the pressure wave picture, it will never be possible to trace out the trajectory of a single molecule, even though the complete mechanical description of the system assigns a definite trajectory to each of the very many molecules. Assuming the success of efforts to accomplish a complete physical description, the statistical quantum theory would, within the framework of future physics, take an approximately analogous position to the statistical mechanics within the framework of classical mechanics. I am rather firmly convinced that the development of theoretical physics will be of this type; but the path will be lengthy and difficult. If the quantum wave is not a complete description of the physical system, then Einstein has a ready explanation of the probabilities that have now entered into physics in quantum measurement processes: they are merely expressions of our ignorance. If an atom has a probability of one half of radioactive decay over an hour, then all that really means is that its wave function describes an ensemble of many different atomic systems, half of which decay in an hour. Whether one particular atom in the ensemble will decay in one hour is definitely determinable. However we will not be able to discern it if all we know is the quantum wave associated with it. Whether it decays or not depends upon properties of that system that have been smoothed away by the quantum wave and thus are unknown to us. It is our ignorance of these smoothed away properties that makes a probabilistic assertion the best we can do. To Max Born, December 4, 1926. In Born, Born Einstein Letters, 91. Quoted from Alice Calaprice, ed., The Expanded Quotable Einstein. Princeton University Press, 2000. p.245. "Quantum mechanics is very worthy of regard. But an inner voice tells me that this not yet the right track. The theory yields much, but it hardly brings us closer to the Old One's secrets. I, in any case, am convinced that He does not play dice. To Cornelius Lanczos, March 21, 1942, Einstein Archive, 15-294. As translated in Albert Einstein: The Human Side. H. Dukas and B. Hoffmann, eds., Princeton: Princeeton Univeristy Press, 1979, p. 68. "It seems hard to sneak a look at God's cards. But that he plays dice and uses 'telepathic' methods (as the present quantum theory requires of him) is something that I cannot believe for a single moment. A note of caution is needed. The analogy to pressure waves in air is my analogy. It suggests that Einstein somehow imagined a real, point-like particle hiding behind the quantum wave, a picture not so removed from the Bohm hidden variable theory. Perhaps Einstein did entertain a picture like this in his earlier speculations. However what is quite distinctive about his mature statements of the incompleteness of quantum theory is that they are extremely cautious in describing the reality that may be hidden the statistical wave. Einstein remains as uncommitted on the question as he can possibly be. We do know, however, where Einstein hoped to find the theory that would ultimately complete and even replace quantum theory. After he completed his general theory of relativity in the 1910s, Einstein embarked on the program of extending it to cover electromagnetism. The general theory of relativity had shown that gravity could be incorporated into the geometry of spacetime if we allowed for a curved geometry. The hope was that further generalizations of the geometry of spacetime would allow a geometrical treatment of electricity and magnetism. This was his famed goal of a "unified field theory." In the process, Einstein hoped, a fuller account of quantum processes might emerge. Einstein pursued this project for decades, up to his death. However, the final results were inconclusive. As he dug himself deeper into these investigations, the mainstream of physics turned in other directions. While Einstein was struggling to understand how to unify two forces, gravity and electromagnetism, physics had discovered two more fundamental forces, the weak and strong nuclear forces. And while Einstein focussed on the geometrical approach that proved so fruitful in the 1910s, quantum physicists were dealing with a new theory in which the idea of an observer independent reality was becoming elusive. When two states become entangled, a complete account of the properties of one of the systems is not possible if it does not include the other system; and this will be true no matter how far apart the two systems may be spatially. Entanglement can be illustrated if we consider the property of position in space of a quantum particle. If there is just one particle, we have already seen how the position property is discerned. The particle will in general be represented by a wave spread in space. We measure the position of the particle and this triggers a collapse to just one point in space. How do we get two lobes like this? It is the situation that would arise if we confined the particle to a box that had two disconnected chambers. The particle wave is non-vanishing only inside the two chambers but is zero everywhere else. We do not perform a measurement that discerns the exact position of the particle. Rather, we merely measure whether the particle is in the left or right chamber. The measurement will collapse the wave to one or other of its two lobes. Now take the case of two boxes, A and B, each with its own particle. As before the particles are spread over the two chambers. Drawing their wave functions is a little more complicated and this complication will be origin of entanglement. A picture of the A particle wave in its A space and a picture of the B particle wave in its B space by themselves omits essential information about how the two particles are correlated. In fullest quantum account, we do not have two waves, one for each particle. There is only one wave corresponding to the two particles and that one wave resides not in ordinary three dimensional space, but in the six dimensional configuration space of the two particles. This six dimensional space has three axes for the possible positions of the A particle; and another three axes for the possible spatial positions of the B particle. Picking one point in the space specifies a position for both the A and the B particle. The resulting six dimensional space is impossible to draw easily. However we get the essential idea if we idealize each particle as living in a one dimensional space: a one dimensional A space and a one dimensional B space. The corresponding configuration space is a two dimensional space. One of its dimensions is A space; and the other is B space. Each point in this two dimensional space gives us one spatial coordinate for the A particle and one spatial coordinate for the B particle. The wave that represents both particles is a wave in the two dimensional configuration space. The wave is zero everywhere except for two lobes. There is a lobe in the region that corresponds to the left chamber "L" of box A and the left chapter "L" of box B; and there is a second lobe in the region of the the right chamber "R" of box A and the right chamber "R" of box B. If we measure the position of the A particle, the wave will collapse to one or other lobe. For concreteness, let us say it is the first lobe; the A particle will now definitely be in the left chamber. That same collapse will automatically induce collapse of the B particle to its left lobe and thereby confer on the B particle the property of definitely being in the left chamber. That is the remarkable outcome. As a result of a measurement on the A particle, the B particle has acquired a more definite position, even though the two particles may be widely separated in space. The A particle may be in a box on my table. The B particle may be in a box on a space station on Mars. This is entanglement. The properties of the B particle are simply not separate from those of the A particle no matter how far apart they may be in space. We measured the A particle that resides on earth; and the B particle on Mars was affected. If you are learning of entanglement for the first time and you are not amazed by this result, you should go back and re-read the last few paragraphs. The case just analyzed is the case of the left-right positions of the two particles perfectly correlated: that is, a "left" for the A particle always goes with a "left" for the B particle; and a "right" for the A particle always goes with a "right" for the B particles. Other cases are possible. Here is the wave for the case of two perfectly anti-correlated particles. You should reflect on the figure until you are convinced that on measurement a "left" on particle A always goes with a "right" on particle B; and conversely. The difference between correlated and anti-correlated particles cannot be represented in the A or B spaces of the two particles individually. They can only be represented in their joint configuration spaces. That is why the use of configuration space is so essential. It lets us represent otherwise elusive physical properties. Those of you who have seen entanglement discussed elsewhere will probably have seen it expressed differently, as an impossibility of factoring the common wave function into the product of a separate A and a separate B wave. This is the same idea as expressed here in the figures. If we just take one lobe of the common wave function--the left lobe, say, it can be formed by multiplying together the left lobes of the individual wave functions. Undoing the multiplication is just factoring the one lobe into the two separate waves. When we have the fully entangled state with both left and right lobes present, we can no longer represent the combined wave as a simple product of two waves, one from each of the A and B spaces. The earliest fully developed and published version of Einstein's argument against the completeness of quantum mechanics appeared in a 1935 article co-authored with Boris Podolsky and Nathan Rosen and universally known by the initials of its authors, "EPR." A. Einstein, B. Podolsky, and N. Rosen, "Can Quantum-Mechanical Description of Physical Reality Be Considered Complete?" Physical Review, 47 (1935), pp. 777–780. The argument of the paper depends essentially on exploiting entanglement. If one has two entangled systems, one can perform measurements on one of the systems and thereby learn the properties of the other. We have seen how this would work in my example above of a particle distributed over two chambers. The key idea is that the measurement we perform on the first system will not disturb the second, so that whatever property we learn of the second system must be one it possessed prior to our making the measurement. This is why entanglement is such a powerful idea. We can allow that a measurement on the first particle will disturb the first particle. However EPR insist that a measurement on the first particle will not disturb the second particle, which could be removed many light years from the first in space. The argument is then completed by noting that we could have measured many different properties of the first system and, as a result, discovered many properties of the second--many more than an assumption of completeness would allow. This can be seen in the illustration EPR give of their general argument. We imagine two particles that are entangled in such a way that their momenta and position coordinates are equal but opposite in sign. The simplest way to create such an entangled pair is through an atomic event that ejects two particles of the same type in opposite directions. Assume the event is such that the total momentum of the pair is zero. Then, if the first particle has momentum +10 units, the other must have momentum -10 units; and so on for all other possible values. Similarly, the symmetry of the pair assures us that if the first particle has moved to a position +100 units of distance from the creation event, then the other must be at -100 units of distance; and so on for all other possible positions. It follows that we can discover the properties of the second particle at will and without disturbing it, merely by performing measurements on the first particle. We could, for example, discern the second particle's momentum by measuring the momentum of the first particle. Or we could find the position at some moment of the second particle by measuring the position of the first. We do not actually need to perform any of the measurements to be assured that the second particle possesses the properties mentioned. The mere possibility of the measurements is enough to assure us that the properties are really there. That is, we do not need to know the momentum and position of the second particle to be assured that it has a definite momentum and position. We conclude that the second particle must possess both a definite position and a definite momentum. The wave representing the second particle, however, will in general assign neither definite position nor definite momentum to it. Therefore, EPR conclude, the quantum wave is an incomplete description. Are you sensing something familiar about the EPR argument but cannot quite place it? What was distinctive about Einstein's early work was his uncanny ability to find ways of revealing the hidden, inner structure of matter from its measureable properties. We saw this in Einstein's work of 1905 in statistical physics. ("Atoms and the Quantum.") There he looked at the measurable properties of sugar solutions--their viscosity and rates of diffusion--to infer to the size of molecules. The analysis of Brownian motion also led him to an estimate the the size of molecules. And, most revolutionary, he recognized the signature of atoms in the measurable thermodynamic properties of heat radiation. That led him to his light quantum hypothesis. In the EPR argument, we see something analogous. Einstein once again wants to reveal the hidden properties of quantum particles and he finds a way based on measurement to get at them. This time the measurements are on remote entangled systems. The discussion above summarizes the EPR argument. However it does not fully expose the assumptions that it makes. For the argument to succeed, there are two assumptions needed and both have been subject to quite intense scrutiny in the literature. The first is separability. EPR tacitly assume that two systems widely separated in space have independent existences, so that the state of one can be specified fully without consideration of the second. The second assumption is locality. EPR assume that a measurement here cannot affect a system there if here and there are spacelike separated, that is, any influence propagating from one place to the other must proceed faster than light. Both assumptions are disavowed by standard quantum mechanics. Entangled states violate separability and measurement collapse is instantaneous. The admissibility and persuasiveness of the EPR argument depend essentially on the extent to which one accepts these two assumptions. One might discard them just because quantum theory, our most successful theory of matter, does not adhere to them. Or one might adopt them precisely because one senses this is the beginning of the escape from the deeper woes of the measurement problem. "If, without in any way disturbing a system, we can predict with certainty (i.e. with probability equal to unity) the value of a physical quantity, then there exists an element of physical reality corresponding to this physical quantity." Einstein's own later statements of the essential argument were much briefer and clearer. Here is version from his article "Physics and Reality" (Journal of the Franklin Institute, 221, 1936). [Footnote] *A measurement on A, for example, thus involves a transition to a narrower ensemble of systems. The latter (hence also its ψ function) depends upon the point of view according to which this reduction of the ensemble of systems is carried out. Here's the version given in Einstein's Autobiographical Notes, written over a decade after the EPR paper. It is worth quoting at length since it surely represents Einstein's most considered view, expressed in the way he thought most fitting. "There is to be a system that at the time t of our observation consists of two component systems S1 and S2, which at this time are spatially separated and (in the sense of the classical physics) interact with each other but slightly. The total system is to be described completely in terms of quantum mechanics by a known ψ-function, say ψ12. All quantum theoreticians now agree upon the following. If I make a complete measurement of S1, I obtain from the results of the measurement and from ψ12 an entirely definite ψ-function ψ2 of the system S2. The character of ψ2 then depends upon what kind of measurement I perform on S1. If now the physicists A and B accept this reasoning as valid, then B will have to give up his position that the ψ-function constitutes a complete description of a real state. For in this case it would be impossible that two different types of ψ-functions could be assigned to the identical state of S2. The statistical character of the present theory would then follow necessarily from the incompleteness of the description of the systems in quantum mechanics, and there would no longer exist any ground for the assumption that a future foundation of physics must be based upon statistics. One remark is especially noteworthy since it makes clear the importance of locality and separability in Einstein's argument. He canvasses two possible escapes from his conclusion of the incompleteness of quantum theory. They are "measurement of S1 (telepathically) changes the real state of S2"--that corresponds to a violation of locality. The second is "denying altogether that spatially separated entities possess independent real states"--that is the violation of separability. In plumbing the depths of Einstein's objections to quantum theory, his concern to preserve separability seems to be the deepest and most fundamental. Certainly separability is logically prior to locality. One cannot require systems here to interact locally with systems there unless one can already distinguish systems here from systems there. That distinction requires separability. "Without such an assumption of the mutually independent existence ... of spatially distant things, as assumption which originates in everyday thought, physical thought in the sense familiar to us would not be possible. Nor does one see how physical laws could be formulated and tested without such a clean separation. "Translation from Don Howard, "Einstein on Locality and Separability," in Studies in History and Philosophy of Science, 16 (1985), pp. 171-201 on . In all this, Einstein was defending a minority view in the physics community. The task of responding to Einstein was taken up by Niels Bohr. The debate in which they engaged was surely one of the monumental debates of the 20th century. Here were two titans of modern physics with quite opposed positions, struggling to establish their view of the meaning of the quantum. The great difficulty in following the debate, however, is that its canonical history has been written by Bohr in his contribution to the Schilpp Einstein volume. There one finds a story of a far-sighted Bohr, who recognizes the profound philosophical re-orientation brought by quantum theory; and a reactionary, recalcitrant Einstein unable to accommodate the novelty. Einstein's view was, we would expect, somewhat different. Unfortunately Einstein gave no extended, published account of his perspective on the debate. In private correspondence, he was quite disparaging of Bohr, calling him a "talmudic philosopher [who] doesn't give a hoot for 'reality,' which he regards as a hobgoblin of the naive..." (Einstein to Schroedinger, June 19, 1935. Translation from Don Howard, "Einstein on Locality and Separability," in Studies in History and Philosophy of Science, 16 (1985), pp. 171-201 on p. 178.) Niels Bohr, "Discussions with Einstein on Epistemological Problems in Atomic Physics" in, P. A. Schilpp, ed., Albert Einstein-Philosopher Scientist. 2nd ed. New York: Tudor Publishing, 1951. "...it is decisive to recognise that, however far the phenomena transcend the scope of classical physical explanation, the account of all evidence must be expressed in classical terms. The argument is simply that by the word "experiment" we refer to a situation where we can tell others what we have done and what we have learned and that, therefore, the account of the experimental arrangement and of the results of the observations must be expressed in unambiguous language with suitable application of the terminology of classical physics.
" The "must be" seems to me excessive and unwarranted. Somehow, in a way he does not describe, Bohr is able to preclude the description of my sensing a flash of light as "I sensed a photon" where photon is a term whose meaning is given by quantum theory. Classical terminology is peculiarily well-adapted to ordinary sized objects since it arises in a theory designed to describe them. So it is easy to continue to use classical terms when we describe quantum experiments with ordinary sized objects. We should not confuse that comfort with our having no alternative. "This crucial point, which was to become a main theme of the discussions reported in the following, implies the impossibility of any sharp separation between the behaviour of atomic objects and the interaction with the measuring instruments which serve to define the conditions under which the phenomena appear. In fact, the individuality of the typical quantum effects finds its proper expression in the circumstance that any attempt of subdividing the phenomena will demand a change in the experimental arrangement introducing new possibilities of interaction between objects and measuring instruments which in principle cannot be controlled. Consequently, evidence obtained under different experimental conditions cannot be comprehended within a single picture, but must be regarded as complementary in the sense that only the totality of the phenomena exhausts the possible information about the objects. The main theme was then illustrated vividly and effectively with a series of descriptions of the various measurement devices, described in a "semi-serious" realistic style, in order to make clear that performing one measurement precludes the performing of another. For example, a position measurement on a propagating particle might employ a slit firmly bolted to the bench through which the particle passes. We then know the exact height of the particle when it passes through the slit. A momentum measurement, however, would require a movable slit, whose recoil under the passage of the particle would let us determine the size of a momentum transfer to or from the particle. That essential moveability of the slit precluded the fixed slit arrangement of the position measurement. The mutual exclusivity of the two arrangements of measurement apparatus is reflected in the complementarity of the quantities of position and momentum. Bohr then developed further examples, included the celebrated Einstein "photon in a box" thought experiment. Overall, on Bohr's account so far, Einstein's approach was decisively defeated in the resulting analyses. Needless to say, that did not seem to be Einstein's view. You can read the details of Bohr's discussion in his text and, for a suggestion on Einstein's side, see Don Howard, "Revisiting the Einstein-Bohr Dialogue." "From our point of new we now see that the wording of the above-mentioned criterion of physical reality proposed by Einstein, Podolsky, and Rosen contains an ambiguity as regards the meaning of the expression ' without in any way disturbing a system.' Of course there is in a case like that just considered no question of a mechanical disturbance of the system under investigation during the last critical stage of the measuring procedure. But even at this stage there is essentially the question of an influence on the very conditions which define the possible types of predictions regarding the future behaviour of the system. Since these conditions constitute an inherent element of the description of any phenomenon to which the term "physical reality" can be properly attached, we see that the argumentation of the mentioned authors does not justify their conclusion that quantum-mechanical description is essentially incomplete. On the contrary, this description, as appears from the preceding discussion, may be characterised as a rational utilisation of all possibilities of unambiguous interpretation of measurements, compatible with the finite and uncontrollable interaction between the objects and the measuring instruments in the field of quantum theory. 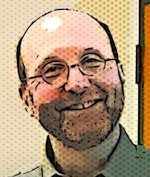 In fact, it is only the mutual exclusion of any two experimental procedures, permitting the unambiguous definition of complementary physical quantities, which provides room for new physical laws, the coexistence of which might at first sight appear irreconcilable with the basic principles of science. It is just this entirely new situation as regards the description of physical phenomena that the notion of complementarity aims at characterising. This explanation of the purported failure of the EPR argument is not easy to comprehend on a first reading. One expects it to become clearer on re-reading. My experience is that this does not happen and I have been unable to find a cogent interpretation of the text. Whether we should persevere or not remains an issue that divides the philosophy of physics community. One part remains convinced that Bohr's insights were profound, but poorly expressed, and we should keep seeking their deeper insights. Another holds that Bohr had vivid thoughts that he believed, mistakenly, solved foundational problems; but these thoughts were incoherent and the opacity of Bohr's writing is simply a result of that incoherence. 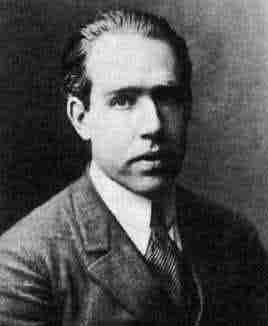 I belong to the second group that finds Bohr's thought opaque. My best efforts find Bohr advocating a kind of ultra-empiricism that entangles epistemology (how we know things) with ontology (what things are). The idea is that what something is, is inseparable from how we actually happened to find out about it. The EPR argument requires us to imagine two different measurements that we might perform on the first system; and from their possible outcomes we infer to the properties of the second. EPR presume that it is possible to know what would happen were two different measurements performed on the system. Bohr's ultra-empiricism asserts that the two systems would not be the same system if different measurements were performed on them. For what the system is, involves essentially which measurement is performed on it. What EPR think of as one system, explored by different measurements, is, for Bohr's ultra-empiricism, two different systems. It follows that EPR are mistaken in imagining that the two measurements could be performed on the very same system. The first steps of the EPR argument are blocked. While this seems to be Bohr's argument, it is opaque to me why Bohr thought this ultra-empiricism is compatible with quantum theory. It amounts to a denial that quantum theory supports what philosophers call "counterfactuals"--statements of what would have happened were, contrary to actual fact, some other conditions to be the case. Quantum theory clearly supports counterfactuals. When we have a spread out quantum wave representing some particle, standard algorithms in the theory tell us what would happen were we to perform this measurement, or, instead of it, had we performed that measurement. Generally the description of what would happen is expressed in terms of the probabilities of various outcomes. But there is no difficulty in recovering the result. Thus, there seems no problem as far as quantum theory is concerned when EPR assert what would happen were this measurement or another incompatible measurement to be performed. "...it must seem a mistake to permit theoretical description to be directly dependent upon acts of empirical assertions, as it seems to me to be intended [for example] in Bohr's principle of complementarity, the sharp formulation of which, moreover, I have been unable to achieve despite much effort which I have expended on it. From my point of view [such] statements or measurements can occur only as special instances, viz., parts, of physical description, to which I cannot ascribe any exceptional position above the rest"
Not many scholars have the distinction of being told in print by Einstein that he has been unable to discern precisely what they are asserting "despite much effort"! While the final outcome of the debate remains controversial in the philosophy of physics literature, I can state my own view. In his debate with Bohr, Einstein won. Einstein's argument is clear and powerful. Bohr's claims are either obscure or indefensible. One can win a battle, but lose the war. And that is what happened. Einstein won the debate with Bohr, in my view. In his debate with quantum theory, Einstein lost and unequivocally so. The reason for his loss did not emerge during his lifetime. They came in the decade after his death through the work of John S. Bell. The story of Bell's work and the flood of work it inspired is too large a topic to treat adequately in this short section. We can see only some preliminary fragments here. What Bell noticed was a lacuna in Einstein's argument. Einstein correctly noted that measurements on a system would enable the prediction of outcomes of measurements on another system entangled with it. By imagining different possible measurements on the first system, one then merely used the computations of the quantum theory to determine the outcomes of the measurements on the second system. Einstein presumed that all these possible outcomes reflected properties possessed by the second system. That meant that all possible measurements would end up revealing a single set of possessed properties. What Bell showed was that this last assumption failed. If one assumed that the computations of quantum theory correctly predicted the outcomes of measurement, then there was no consistent set of hidden properties consistent with all possible measurements. Or, more precisely, if one assumed separability and locality, then there was no such set. The situation is not so removed from the familiar parable of the blind men and the elephant, but with an essential twist. In it, several blind men feel different parts of the elephant, each imagining a very different animal on the basis of the limited portion they sensed. We, however, recognize that each part they describe can be fitted together to describe the one familiar animal. In the quantum case, however, each of the different measurements yields results that cannot be fitted together to describe a single independent reality. So it is as if the blind men report parts that cannot be integrated consistently into one animal. Bell's arguments cannot be developed here. They go beyond the ideas developed above. But they do so only in the technical details, not in matters of basic principle. To begin, Bell set his analysis in the context of a version of the EPR argument laid out by David Bohm. That version was devoted specifically to the measurement of a quantity known as "spin." It was used since, in the context of quantum mechanics, is it actually one of the simplest magnitudes. Bell then assumed that entangled systems do have properties that conform with Einstein's expectations of separability and locality; and that these hidden properties fix the probabilities of the various outcomes that arise on measurement. The outcomes are only constrained by these probabilities, so generally we cannot be sure which ones will appear in any one measurement. However, in many repeated experiments, definite trends will emerge. They will take the form of correlations between the outcomes returned by measurements on each of the two entangled particles. What Bell showed is that a characteristic parameter of these correlations will always lie in a small interval of values. The assertion that they lie in this interval is the Bell inequality. In later treatments, this interval spanned -2 to +2. The parameter of Bell's inequality can also be determined by assuming that the measurements conform to the predictions of the quantum theory. The result of that calculation is that the parameter is greater than 2 for the particular case treated. It follows that a theory conforming to Einstein's expectations cannot yield the same predictions as quantum theory. Since we have high confidence in quantum theory's predictions, this was taken as a demonstration of the failure of Einstein's assumptions. There was a loophole Was it possibility that the predictions of quantum theory were incorrect on this parameter? Later experiments, such as reported by Aspect in 1981, affirmed that the quantum predictions were correct. The loophole was closed. The final outcome is that the EPR argument for the incompleteness of quantum theory fails. Whatever reality lies behind quantum processes does not conform to the presumptions of the EPR argument. We cannot keep both separability and locality. Something has to be given up. For more see Abner Shimony, "Bell's Theorem", Stanford Encyclopedia of Philosophy. So what should our verdict be of Einstein's recalcitrance in the face of the new quantum theory? Here is my view. Einstein was wrong in his suppositions of separability and locality in the quantum domain. In his time, they were entirely reasonable demands and it was very hard to see then that they would fail. That they do fail is the lesson we have now learned. However, in my view, he was not wrong to resist the foundational accounts that surrounded quantum theory in his final decades. He was quite right to protest that no account of the quantum domain could so glibly give up the notion of reality as they did. All was not well then in our accounts of the quantum domain; and all is not well now. The clearest indication of the trouble is the persistence of the measurement problem. It shows us that there is something quite unresolved in the foundations of quantum theory. In the early years of the theory, as new empirical and theoretical advances came in rapid succession, it was easy to overlook these problems. It is not hard to image the pressures faced by any critic of a new, rising theory. Any new theory has small problems that will be resolved soon enough, we can imagine Einstein hearing from the theory's proponents. These problem are not usually reasons for grave concern. Why should one doubt a theory will such a prodigious record of success? Why hold up real progress with quibbles? Is it not expedient to suspend criticism? Quoted from Arthur Fine, The Shaky Game.University of Chicago Press, 1988, p.18. While we now may not agree with the nature of Einstein's positive complaints concerning the newly emerging quantum theory, it is now abundantly clear that something was not and is not right with the theory. In hindsight that we see that Einstein's resistance was appropriate and should be celebrated. I can see that clearly now, but I doubt that I would have had the clarity and character to see it in 1928. I do not have the insight and principle of Einstein. What Einstein meant when he asserted the incompleteness of quantum theory. 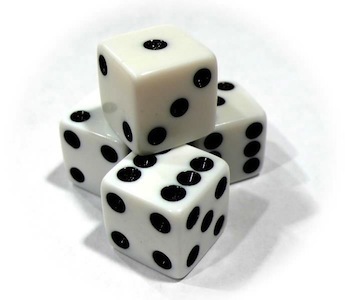 What Einstein intended with his "dice" remark and how it relates to nineteenth century conceptions of causation. How Einstein used it in his EPR and later arguments aimed at establishing the incompleteness of quantum theory. The notions of separability and locality. How the EPR argument depends upon them. Some sense of the Einstein-Bohr debate. That it did not end well for Einstein when Bell's work appeared in the 1960s. That we should not judge Einstein harshly. HIndsight is 20-20. Copyright John D. Norton. March 27, April 11, April 20, 30, 201; January 30, 2013.